Dax was a bad dog, a very bad dog. The Parson Russell terrier, a tight-bodied, little white dog whose ancestors were bred centuries ago to hunt fox, was prone to tangle with raccoons and opossums in the backyard of his owner's Grosse Pointe home. His nighttime standoffs with wildlife ended only when his owner shooed Dax's opponent away with a spray from the water hose. "He was usually fine during the day," his owner, Janice Cassetta, said. "At night, he was a nightmare." But the daytime had its pitfalls. Dax was unruly on his leash during walks, and he was known for his hostility toward neighborhood dogs. At her wit's end, his 23-year-old owner, who knows something about dog training herself, called up other dog trainers. Neither her knowledge nor theirs could curb Dax's wayward ways. But then she heard about an eccentric Russian dog trainer named Vladae Roytapel from two of his very pleased clients. Roytapel was named Michigan's Dog Trainer of the Year in 2005 and is well known throughout the Pointes and in parts of Oakland County, where he has made believers of many bad-dog owners. His company, Alternative Canine Training, which employs co-trainers Bonny Wainz and Cindi Fleishans, has offices in Sterling Heights and Royal Oak. "After the first session, I was thrilled," said Cassetta, a full-time student working on a special education degree at Wayne State University. Nearly six months since beginning training with Roytapel, 3-year-old Dax won't leave the back door until told to go. He trails behind people when taking the stairs, rather than bolting ahead of them. He is no longer a neighborhood bully to other dogs. He basically comes when called and does what he's told and is the epitome of an obedient pet. And he can follow directions in two languages, English and Spanish. "Abajo," Cassetta tells him. Zach goes down in the grass near Cassetta's feet. "Espera," she says. He stays, panting gently in the sunlit grass, attentively waiting for the next command. Amazingly, Cassetta points out, he's also earned his Canine Good Citizen certificate from the American Kennel Club, a distinction given to dogs that prove, when put through their paces, that they can follow commands. More amazingly, said Cassetta, Dax has recently been certified as a therapy dog and will soon be cheering up patients at hospitals, nursing homes and such. "When I first met this dog, he was like a police officer in this household. He was in control," recalled Roytapel, 43, of Troy. Roytapel starts most of his consultations and training the same way: by teaching the owner to see things from the dog's point of view. He puts the leash around the owner's wrist, pulls on the leash and demonstrates the sounds that a dog hears. "They have to play the role of the dog to understand how their dog thinks," he said. 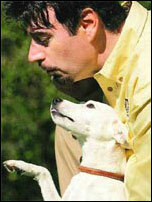 He calls himself the dog whisperer and dog wizard, and he says he can communicate with dogs in their language. He calls it doglish. That means mimicking the sounds that dogs make to one another and imitating their postures and other behaviors. For example, a high-pitched, howl-like voice will make a dog happy and attentive. A low-pitched growl-like sound is supposed to get a dog to submit. 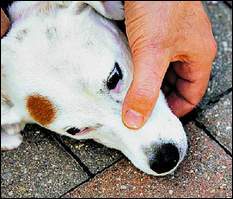 Particularly stubborn alpha dog types may require a "bite" that puts a dog in its place. The bite is akin to the mother's grabbing a pup's snout to calm it down. To do that, Roytapel grasps the dog's snout with his fingers in a jawlike shape, holding the snout until the dog succumbs. Beyond his communication with the dog, Roytapel sometimes employs a shock collar to get the dog to associate a negative force with a bad behavior. Knowing that a shock collar may seem cruel, Roytapel explained that it is rarely used; he describes the sensation as an annoying tone or vibration that's enough to deter a dog from bad behavior. The average price is $120-$150 for a private 2-hour lesson. Often the training is taught in a series of lessons, depending on the level of obedience the pet owner is after. 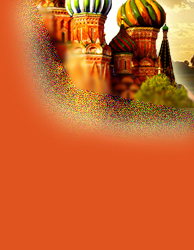 Roytapel has made believers of hundreds of clients since moving from Russia to metro Detroit 10 years ago. In Russia, he trained dogs for the KGB, the Russian Army and other government and private agencies, and he learned from a deaf-mute dog trainer who communicated with animals completely with noises. Roytapel came to Detroit to train dogs for Focus: HOPE. He later started Alternative Canine Training, a program that he is attempting to patent. He is energetic. His Russian accent is thick. His confidence is high, perhaps boosted by all the TV appearances he makes, from Fox 2 news every Monday at 7:30 a.m. to the "Late Night With David Letterman" show three weeks ago. He showed Letterman how to be a dog and wrapped a leash around his wrist, and he quickly transformed a show producer's jumping dog with his understated communication. Roytapel also has trained the dogs of some of Detroit's well-known sports figures, including Steve Yzerman and Kirk Maltby of the Red Wings. Roytapel's style is entertaining and funny. He makes comments like, "Most of the dogs in this country think No is their nickname." Still, he sees what he does as being very serious. "I have been called into homes on the verge of divorce," Roytapel said. "I have people with dogs they treat as children, who have to decide what to do with their dog when it bites their child. I have had notorious dogs. If you ask me if they all can be saved, the answer is no. But if I can't do it, no one can." Cassetta's boyfriend, Gary Abud Jr. of Grosse Pointe Woods, has been trained to be an authority figure for Dax, and he has been astounded by the transformation. "Before I met Janice, I had only been around untrained dogs," Abud said. "I didn't know how nice it could be to have a well-trained dog." He says this while watching Dax follow Janice to greet Roytapel and his two German shepherds when they arrived at her house last Sunday. "Before, this would have been a fight," Abud said. Roytapel brings his dogs, Mika and Elke, to most training sessions to socialize his clients' dogs. He also uses them as training dummies in a way, to teach a dog how to be nice. Last week, Roytapel's quiet growl and slightly bared teeth had Dax turning over on his back immediately and submitting. "When I first met this dog, he kind of attacked mine," Roytapel said. "I explained to the owner that this aggression comes from the alpha category. Now he knows he is not the boss. She is the boss." KIM NORTH SHINE can be reached at 313-223-4557 or at kshine@freepress.com.